Summer’s coming, and we want to look nice and cool, like a just poured glass of cold lemonade. Here are my latest necklaces to keep us fresh for those hot months ahead. 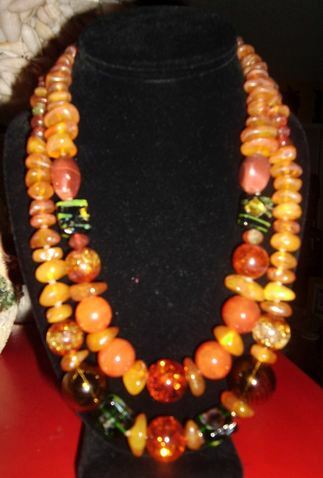 I love the look and texture of Amber. I got this beautiful buttery amber in Gadansk Poland when I was lecturing on a cruise into the Baltic. I stumbled upon a shop with a basement filled with baskets of this georgous ancient tree sap, and the shopkeeper drilled a hole in it; so I could use it with my neckart. 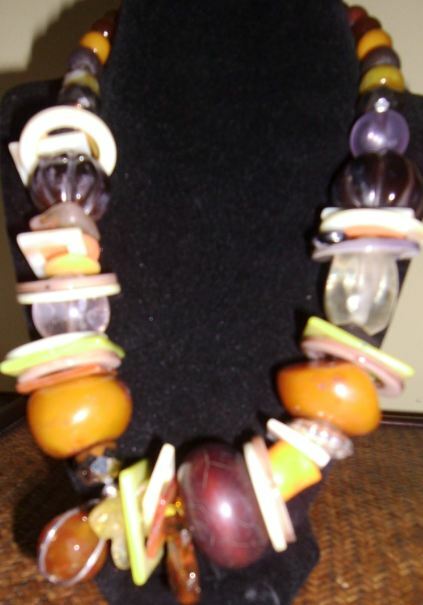 This double strand of amber and Italian glass is 22 inches. Call or email for price. 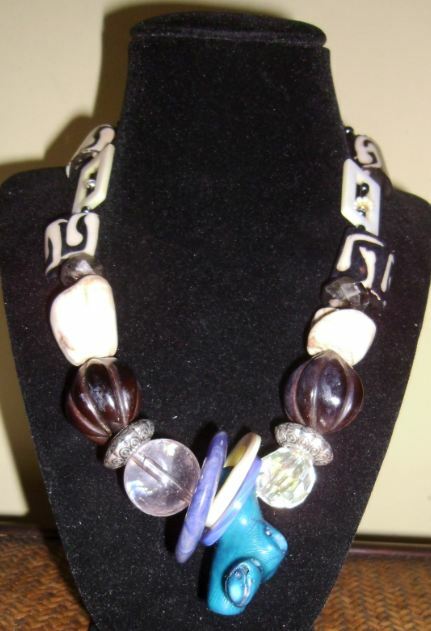 The black and white African beads in a repetitive pattern on three strands adds a strenth to this artistic statement mixed with Egyptian glass and silver blocks adding silent audio to this stunning, and powerful necklace.The clasp is a sterling toggle. Call or email for price. 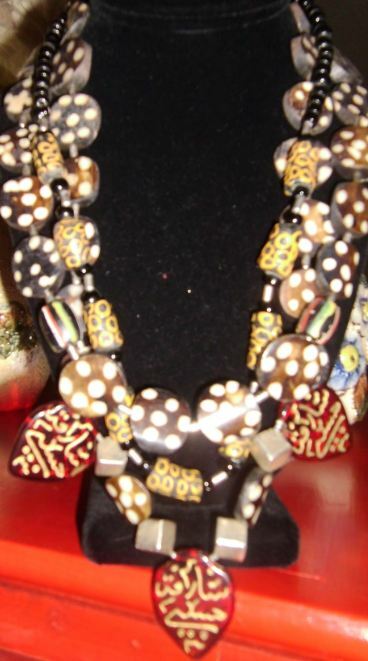 The owner of my favorite bead store called to say she ‘d just returned to Naples from the Tuscan Bead Show. I ran right down and picked out all these beads. My design just came to me immediately, and I couldn’t wait to put them all together. This is the result. 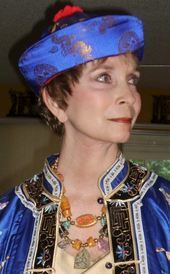 It stands out on it’s own; so it can be worn with a very simple monocolored dress, but I love the mixture of color and pattern, and have shown it with this gorgeous kimono I purchased it and the hat in China in 2003. 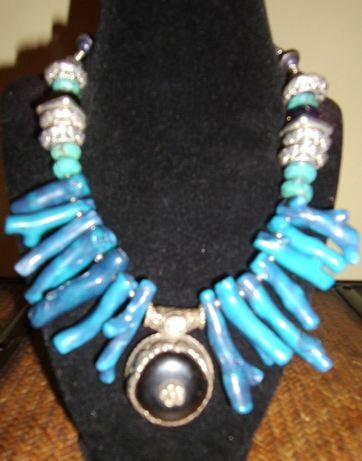 The necklace is actually versatile enough to look well either way. 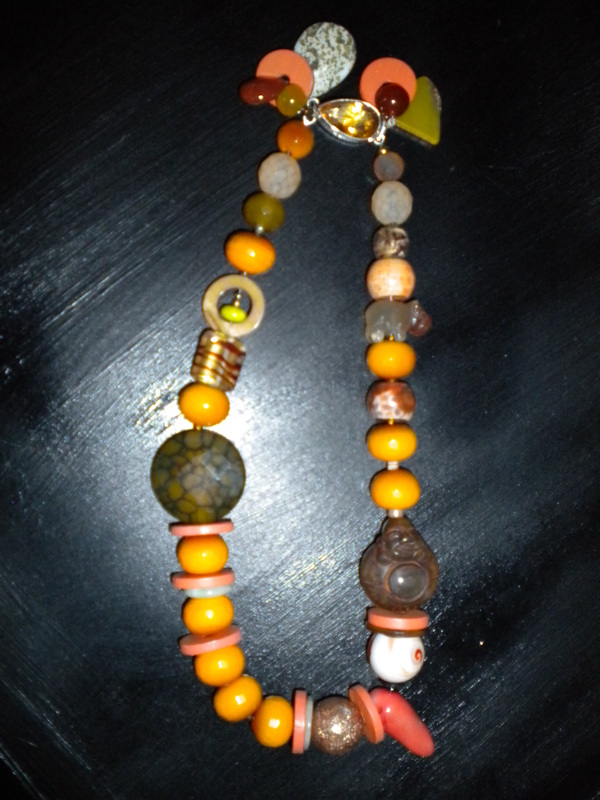 This double strand of coral, Italian glass, agate druzy and brass has a handblown glass clasp. The elements fell into place (a bad pun! 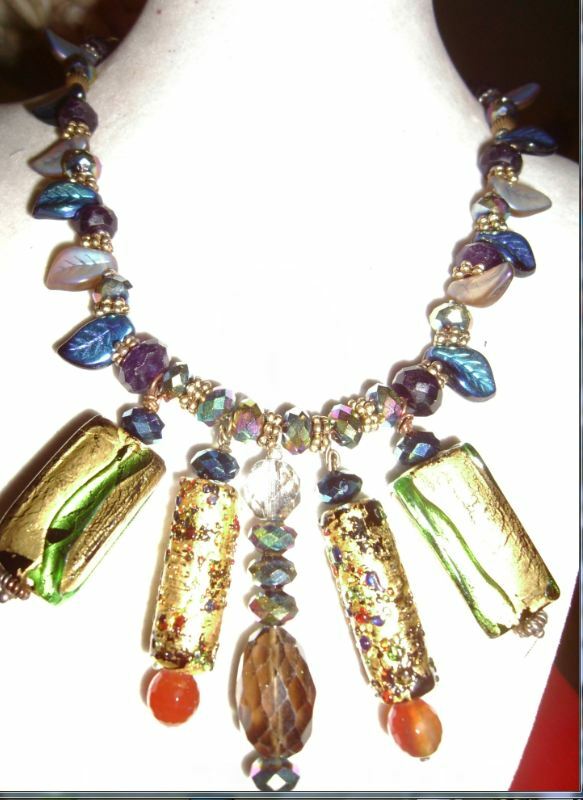 ), but in truth, this necklace seemed to design itself, and though composed of many individual beads, and shapes, it became for me a perfect example of my neckart. When this happens, it brings me a great deal of joy, and gratitude. I’ve been asked to duplicate “Falling Leaves”, but the spontaneity wouldn’t be there, as it was this time around, and that’s why I only do one-of-a-kind pieces. The designs remain fresh. 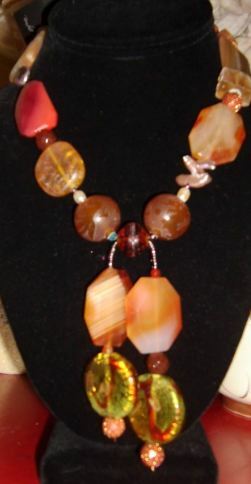 This necklace is SOLD to a lovely buyer from Canada who tried it on, and wouldn’t take it off for me to wrap. 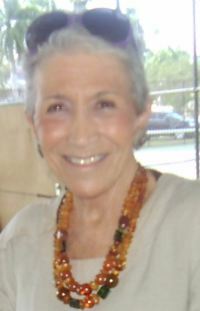 She kept it on with a soft pearl gray cashmere sweater, and pair of light blue jeans. 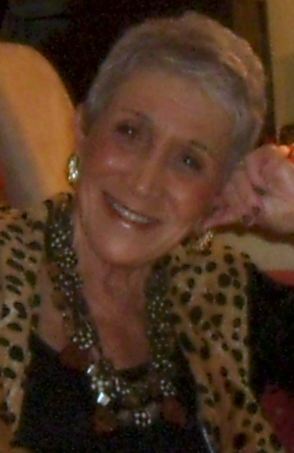 She looked great, and very happy which made me happy as well. 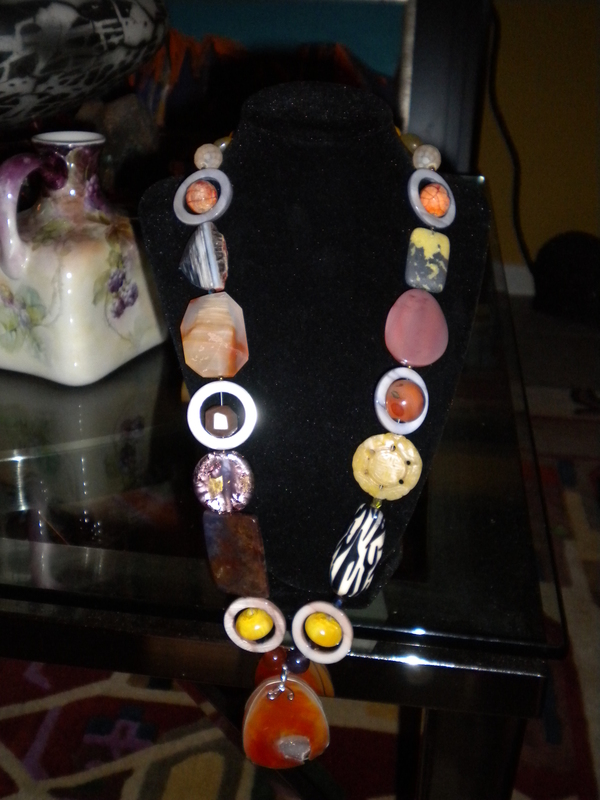 Single strand of coral, black onyx, and mother of pearl shell with a black and white turbo painted by nature. This is a high profile piece; don’t be shy!! Florida. Call or email for price. approximately 18”long. Call or email for price. 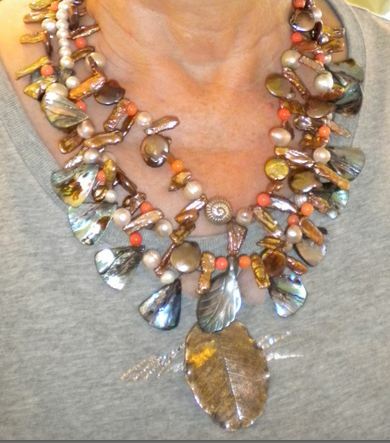 The Photograph in my headliner at the top of the page, is a 16 inch necklace, designed with carnelian, amber, goldstone, raw citrine, and fresh water pearls The pendant consists of two pieces of Italian glass, which I think look like figs (and I love figs); so hence the name! !